I always know when it’s been a long, hard day…or too much life over the weekend…or just plain too much stress. By about 2:00 in the afternoon I start taking these deep breaths and letting them out slowly in a long sigh. I begin to close my eyes for a moment, breathe deeply, and bolster myself for another hour, or two, or three. I push the breath out of my lungs, feeling the power and presence that the art of breathing affords me. It’s a simple thing that reminds me–I’m alive. I’m human. I’m not the energizer bunny. I kick off my shoes, because really, they’re just a hindrance to my comfort. I also make hot tea (like today’s choice of Trader Joe’s Well Rested herbal concoction) and allow the steam to penetrate my reluctance to open my heart to yet more burden. I take a few sips, reminding myself of the comfort of home, and family, and the love of my Lord. And I know that I have the strength, the courage, and the perseverance to go another day. Or at least until 5:00. I remember having tea parties when I was just a little girl. I think it was one of the things my mom liked most about finally having a daughter after three boys. We would dress up my dolls and set them all around the wooden table that my dad made for me. We would set out my favorite tea set (which varied, but was usually the one with Minnie Mouse that I had gotten in Disney World). And Mom would make tea and let it cool. And we would have sugar cubes. I remember the sugar cubes especially, and the little spoon that we served them with. Mom was actually known for always having sugar cubes on hand. She didn’t use sugar in her own tea, but she always wanted to offer the perfect tea to any friend or stranger who entered our home, and living in Maryland, the humidity made it impossible to keep sugar from all sticking together in one big clump–so out came the sugar cubes. 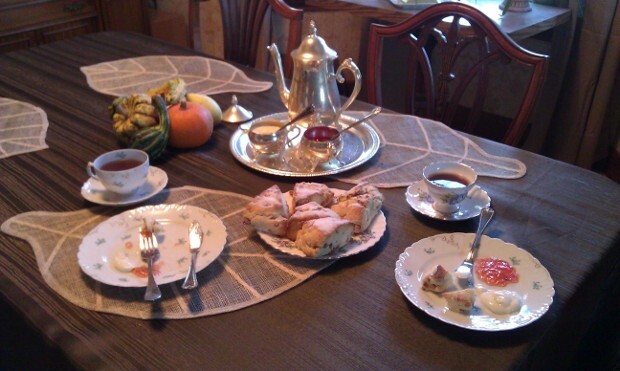 My mom taught me all about serving tea and the lovely things you get to do as hostess. I was never very girly, but I always loved tea. My great grandmother’s china was bequeathed to me, and I was able to move from Minnie Mouse to a lovely old floral pattern. Then a family friend gave me her china from England, a beautiful red set. Then, just recently, my mother scoured local antique stores searching for odds and ends of china that display my favorite flower–forget-me-nots–to build a complete tea set of mismatched but lovely pieces. So today my friend and I sat down to have a real tea together. It’s so rare that I get to take a few hours out of my day to truly appreciate my friendships, and I wanted to make the most of it. So this morning I sat out the forget-me-not plates and a real silver teapot with its little cream and sugar bowls. And I produced linen napkins, place mats and a candle. 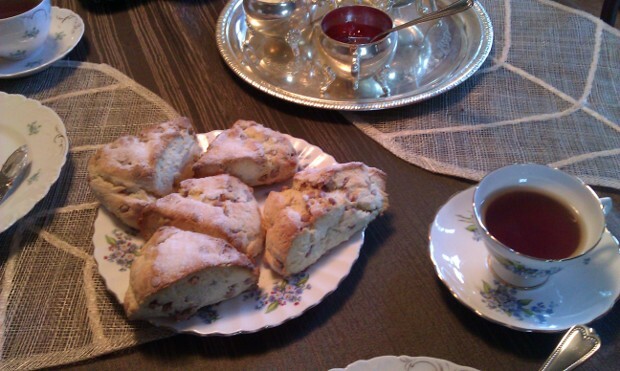 When my friend arrived we made cinnamon chip scones, a cheater’s clotted cream, and Lady Gray tea. We set out the platter with a little apple pie jam and took the time to truly talk over tea. It was a beautiful way to spend an hour or two. Then we hit a used bookstore where I had some credit and scored a few great finds. What can be better than tea parties with just the right friends? And books on top of that? A lovely Saturday. I can see why women used to have tea every day. Can we bring that back? Today I am thankful for tea parties. It seems that every time Friday rolls around, I’m thinking the same thing—boy was that a long week! Will a week ever just be a week? Sure, part of it is some extra stress as I get used to me new responsibilities at work and one of my supervisors is out. And yes, I am working full time and taking a graduate level class and trying to work on my thesis. But really, life is going to continue this way for a while. So I might as well get used to it. •	Don’t attempt to do homework after working all day and cleaning the barn in the evening. I’m exhausted. •	Don’t schedule date night after work and barn for the same reason. 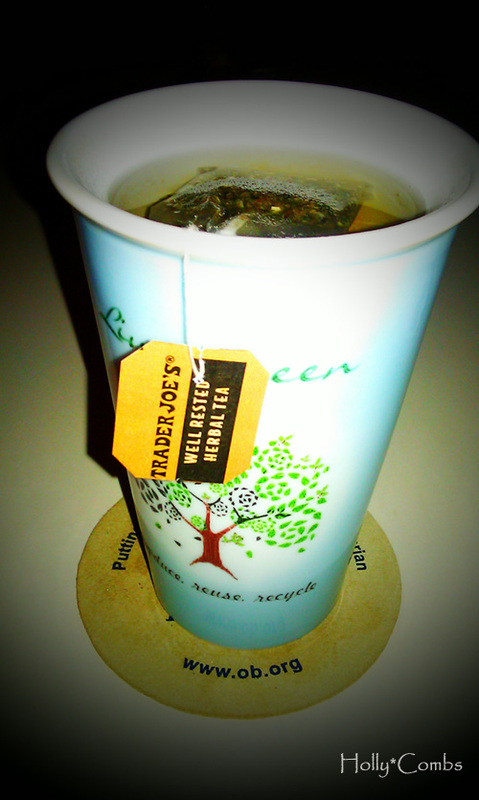 •	Drink lots of hot tea at work in the morning; it makes the day feel a little calmer. •	Don’t plan to do too much on the weekends. •	Don’t stress too much over the state of disarray at the house while simultaneously trying to renovate the bedroom. 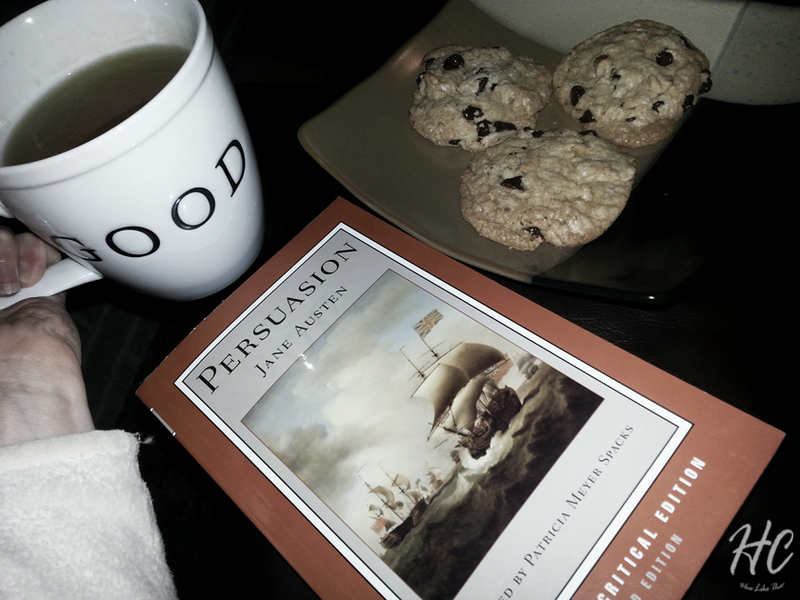 •	Don’t attempt to do homework unless I have the house to myself. •	Purchasing a new dog toy/bone can be very helpful in getting homework done. •	MAKE time for friends; they’re more important than a clean floor. •	Wake up early enough that the morning isn’t rushed; it’s worth giving up 15 minutes of sleep. In other news, the walls of our bedroom are completely prepped and Bob is going to be priming today (since he has the day off and I am working). If all goes as planned, I should get two coats of color on tomorrow. I might have to wait until Monday evening to do the glaze, but it should all be wrapped up in a few days!